WeChat is a mobile communication app born in China in 2011 and currently available worldwide. It has more than 300 million users and it competes directly with similar apps like WhatsApp, Viber or LINE. It comes free with all the functionalities that other apps offer with a registration fee, such as messaging, voice calling, and high quality video calling among others. It doesn’t include any kind of add either. You don’t need a username and password, as WeChat uses your mobile phone number as ID. Or you can also log in with a Facebook account. Once registered, you choose a username to be displayed to your contacts. It’s not a permanent ID, and you can change it anytime. The voice call service is quite different from other VoIP apps, and it works mimicking a walkie talkie. So, you first talk, the voice is recorded and sent to your friend or group of friends. If you prefer real time chatting, the video chat includes voice. However, you need to use this option carefully, because the quality of the video is higher than other apps, and the data consumption is also high. You can use a limited coverage Wi-Fi connection, also free of charge. 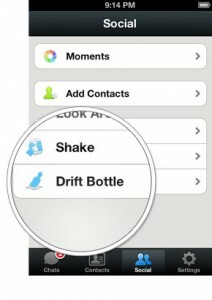 WeChat has many options to add friends to the contact list. You can share ID’s, scan QR codes, sync phone contacts or just shake the phone. If you choose the Shake option, you will see the list of all the people who has shaken the phone at the same time that you, wherever they might be on the planet. There is also another funny way to make friends: a feature called “Look Around”, which allows you to see other people using the same function. There is also a timeline where you can share photos with your friend, and they can make comments. 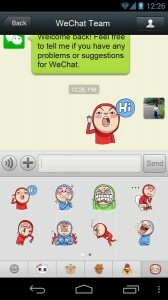 Finally, WeChat has also a huge amount of emoticons to add to your messages, something that many people love. WeChat is a cross platform free app, available for Android, iOS, Windows, BlackBerry and Symbian.